Minor Car Accidents: Will You Have One? You’re backing out of your parking place at the supermarket or pulling out of your driveway at the same time another vehicle moves directly behind you. Before you can stop, you hear the recognizable sound of metal hitting metal. You’ve just been in what is called a “minor car accident.” Statistically, it is impossible to say how many minor car accidents there are each year since many are not reported. Minor car accidents are also identified as low impact crashes. Forbes magazine estimates that the average driver will have a car accident every 17.9 years. That means that drivers will experience at least three accidents by the end of their lifetimes as drivers. There are approximately 10 million accidents annually, including every kind from minor to major crashes. While the damage may be called minor, that does nothing to stop your heart from racing. The first order of business is to calm down. Don’t just pull away. Leaving the scene can have serious consequences even with a fender bender. Check if you’ve been injured or if anyone else in your vehicle was injured. Hopefully, the other vehicle has stopped. Write down his or her plate number and get contact and insurance information from the other driver. Take pictures of the damage to both vehicles if possible. Note where the accident happened, how it happened and other things such as time of day or weather conditions. Sometimes, conditions make an accident more likely such as darkness and inclement weather, both of which can affect visualization of other vehicles. Having a free auto accident app on your cellphone can make keeping details of the accident a lot easier. The damage to your vehicle may appear to be mostly cosmetic such as a scratch or small dent. You might be able to accept that or think that it is something that is inexpensive to repair or perhaps even a DYI project. This reasoning is common, and for many it works out. However, what if the impact was more than shows on the surface. It’s possible that the force could have damaged the axle. This is a major repair job but not something you might not notice at first. By the time you do, weeks have passed, so reporting to your insurance may be useless since they would want to know why the accident was not reported in a 24-48-hour window after it happened. And, after so much time, trying to get the other driver’s insurance, providing he or she was at fault, may be useless. Immediately after a minor car accident, you and your passengers may feel fine. The other driver or passengers in that vehicle may report the same thing. Great, right? Not necessarily. Some injuries take a while to be symptomatic, particularly whiplash. The adrenaline that is pumping through your bloodstream can also make symptoms not noticeable. Either way, assuming you were not injured may be an illusion. Take notice of anything obvious such as a head bump, a momentary feeling of neck or head pain or anything that seems out of the ordinary. Write it down and see how you and your passengers feel the next day. Take note of the other driver’s complaints as well. If he or she says they feel fine, write that down too. No matter you feel it is a good idea to get checked medically. 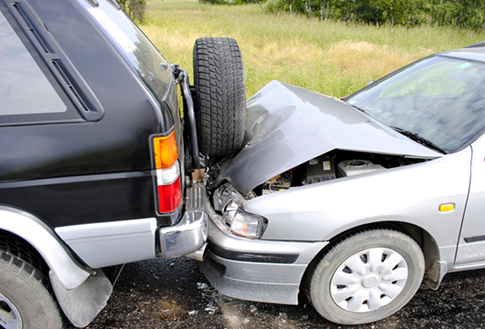 The occurrence of injury in a single crash can vary depending on the physical condition of the victims. For example, in the opening illustration, damage to the vehicle’s looks minor. Neither bumper appears damaged except for the hood on the rear vehicle, which is crumpled. Let’s say that a passenger in the back seat of the lead, black SUV noticed significant neck pain after the accident. The individual visited a physician who did x-rays and noticed degenerative joint disease. Because the pain started only after the accident, the passenger included treatment for neck pain as part of the medical expenses incurred after the accident. In this case, the treatment was estimated as continuing for months, with the possibility of an invasive procedure. The insurer denied payment and the injured party filed a lawsuit against the insurance company and the at-fault driver. The insurer employed an accident recon/bio-mechanic expert to prove that, given the condition of the vehicles after the crash, the accident did not produce sufficient force to cause injury based on crash-test models. The expert added that crumpling of the hood took little force since it was made of sheet metal and easily damaged. A personal injury attorney could argue that crash tests do not consider the physical variability seen in accident victims. In this accident, the injured party was found to have degenerative arthritis of the cervical spine. However, the individual never experienced symptoms from the condition. This condition made the victim more vulnerable to the impact, causing pain that required medical treatment. The pre-existing condition, in this case, was made symptomatic by the collision, and the financial cost should be recoverable. Who Is at Fault in a Fender Bender? Since minor accidents differ widely, let’s look at some of the most common types, and try to determine who is at fault. In some cases, both drivers potentially are at fault. · Parking lots are one place where fender benders happen due to the high density of vehicles in a relatively small space. Backing out of a parking space is difficult at best since other vehicles don’t always stop to let you exit the slot. You need a clear view of what is behind you. If your vehicle is small – think Mini Cooper – and two large trucks are on either side of you, getting a view of approaching vehicles is iffy at best. Even under better circumstances, this is a difficult maneuver since another vehicle can appear out of nowhere. So, who has the right of away? The hard truth is it’s not you. The vehicle in the traffic flow has the right of away. In this instance, you are the one who is entering traffic, and it is your responsibility to be sure the way is clear. Another common scenario is when both drivers attempt to pull into the same space at the same time. In many cases, the drivers will share fault. However, the driver who crosses over the flow of traffic to reach the space is technically at fault. Stop signs are clear signals that you need to stop. Sometimes, they are ignored or not seen. If you are hit the car in front of you, you’re at fault for not slowing down. That depends on who you are reporting the accident to. Both the DMV and the authorities in California require that you report an accident if the property damage exceeds $1,000, or someone was injured or killed. If you are reporting to the insurance company, most insurers demand that you report all accidents. If you don’t, many companies have the right to cancel your coverage. Do You Report a Fender Bender to Your Insurance Company? This is a question many drivers ask when they have a fender bender. Technically, yes, you should call your insurance company as soon as possible. Drivers may not do it because they fear rising rates because of the accident. Many times, a single accident that you did not cause does not result in a higher insurance premium. Overall, rates do increase if you have an accident, even a minor one. For a $2,000 claim, the national average insurance premium hike is 41 percent. In California, CNBC estimates that you will see your premium increase by 75.37 percent. Another consideration is your deductible. Some drivers feel that the deductible they will have to pay for repairs is more than the cost of the repairs if they foot the bill themselves. High-stress incidents like car crashes often bring uncertainty and confusion. Download, print and keep a vehicle collision checklist in your glove compartment to always be ready for the unexpected. There are many questions that need to be answered after a car accident. For minor car accidents, you may wish to discuss your situation with an attorney. In fact, you may be able to file a claim against the other driver, placing him or her at fault. When you are not responsible for the accident, some questions disappear. You will not be required to pay a deductible, and your insurance premiums will probably not go up. David Azizi is an experienced, compassionate attorney with offices in Los Angeles, Beverly Hills and Riverside. He has been called one of the top personal injury lawyers in Los Angeles and Beverly Hills by Expertise.com and Super Lawyers. You can call the Law Offices of David Azizi at (800) 991-5292 to set up a free, no-obligation consult. Give David the facts, and he will let you know your options. It’s that simple.